Amateurs look for tips from professionals. Young basketball players watch YouTube clips of All-Stars’ moves. High school football players copy NFL conditioning drills. The squat is one of the three events in a sport called Powerlifting. 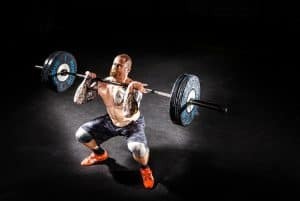 If you want to know how low to go in the squat, it can’t hurt to know how low Powerlifters go. 1. “The lifter shall face the front of the platform. The bar shall be held horizontally across the shoulders, hands and fingers gripping the bar. The hands may be positioned anywhere on the bar inside and or in contact with the inner collars. 2. “After removing the bar from the racks, (the lifter may be aided in removal of the bar from the racks by the spotter/loaders) the lifter must move backwards to establish the starting position. When the lifter is motionless, erect (slight deviation is allowable) with knees locked the Chief Referee will give the signal to begin the lift. The signal shall consist of a downward movement of the arm and the audible command “Squat”. Before receiving the signal to “squat” the lifter may make any position adjustments within the rules, without penalty. For reasons of safety the lifter will be requested to “Replace” the bar, together with a backward movement of the arm, if after a period of five seconds he is not in the correct position to begin the lift. The Chief Referee will then convey the reason why the signal was not given. 3. “Upon receiving the Chief Referee’s signal the lifter must bend the knees and lower the body until the top surface of the legs at the hip joint is lower than the top of the knees. Only one decent attempt is allowed. The attempt is deemed to have commenced when the lifters knees have unlocked. 4. “The lifter must recover at will to an upright position with the knees locked. Double bouncing at the bottom of the squat attempt or any downward movement is not permitted. When the lifter is motionless (in the apparent final position) the Chief Referee will give the signal to rack the bar. 5. “The signal to rack the bar will consist of a backward motion of the arm and the audible command “Rack”. The lifter must then return the bar to the racks. Foot movement after the rack signal will not be cause for failure. For reasons of safety the lifter may request the aid of the spotter/loaders in returning the bar to, and replacing it in the racks. The lifter must stay with the bar during this process. There are different ways to lower yourself in the squat. Work with a trainer that you trust to learn the best way for you.